My daughter has turned 21 today, and I’ve got my alcohol speech all ready to go. I’m only a very slightly annoying mom. All other times, I’m plain adorable. Then we are twins. There are two things in here that excite me, but all the rest puts me right to sleep. We were on such a roll there for awhile though, weren’t we? Just couldn’t maintain the momentum, I guess. Like everything else in life I suppose. I mean how quickly were you over shaving your legs as soon as you were finally allowed to? You know what I’m saying. About two weeks. Okay, let’s review. 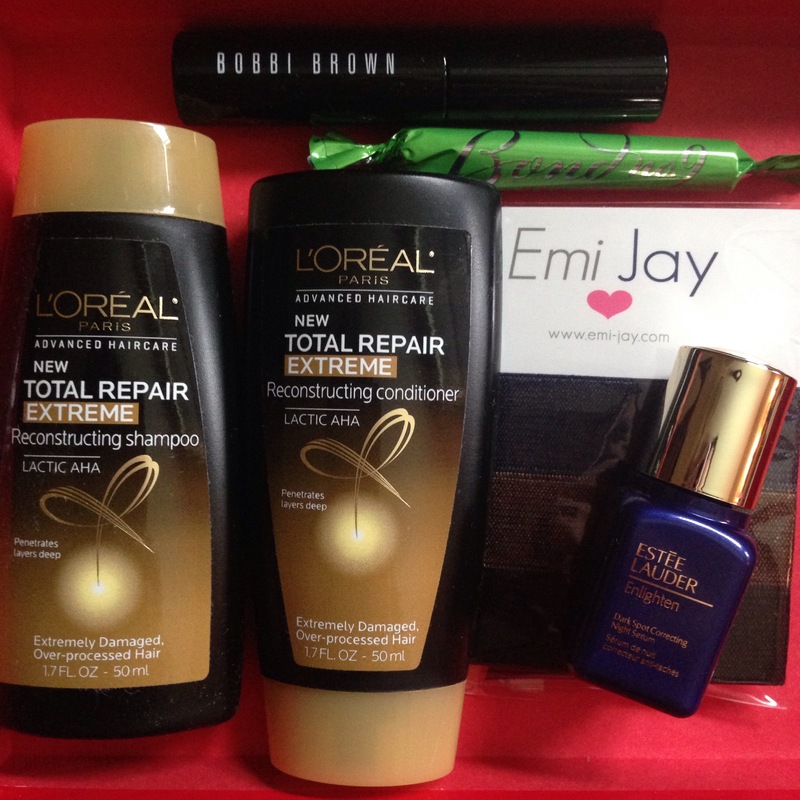 The first poo is the L’Oreal Total Repair Extreme reconstructing shampoo and conditioner. If I can say one nice thing, I will mention the fact I got a matching set. It’s very annoying to get one half of the duo because what am I supposed to do with that? So because I got both things, I will use this at some point in the future. It’s for extremely damaged hair, which I don’t have, although I do flatiron it and you know that can’t be good. Especially because my ends are so fine and delicate. And they are easily irritated and tend to look like the dirty end of a broom even though I goop them up with conditioner every time I wash. Having said all that, I will let you know how this one fares. If a miracle happens upon my head, believe me you will be the first to know. One thing I was super happy to receive is the Bobbi Brown Smokey Eye mascara. If you haven’t gathered from the past 132 posts, I have a mascara addiction. Any opportunity to try out a new one, I’m first in line. I’ve been known to buy random, unnecessary things from Sephora.com just so I can qualify for the free mascara sample. Cuz free is still free, even if you have to spend $25 to get it. So this is a pretty nice mascara. It builds decent volume. Length is acceptable. Brush isn’t too big. I wasn’t like stopped in my tracks or anything – believe me, that has happened – but I wasn’t disappointed either (which has also happened – a lot). But most importantly, it was FREE, so even if it stinks it’s still pretty good. Why keep a happy moment going when we can ruin it all to hell with just a few short words? Along the lines of “Bond No. 9 High Line perfume” or thereabouts. If you like the smell of bergamot, tulip, purple love grass, indian rhubarb, sea moss and musk, then you should buy this. Although I’m pretty sure three of those things aren’t actual things. Purple love grass especially. If this truly exists, then I want a whole front yard full of it. Anyway, y’all know perfume isn’t my thing, so this stuff could literally smell like little cucumber sandwiches in a garden full of exotic potted plants while drinking tea with the Queen of England, and I would still have to pass. I may never get my Ladyship for saying that, but I’m just gonna have to take that chance. Then I got a packet of the Emi Jay hair ties. Not a beauty item, but a useful item at any rate. I have several of these hair ties, and I do like them. They don’t crimp your hair as much as elastic ties do. And if you have thicker hair than me, they probably don’t crimp your hair at all. Ummm … what else can I say about these? Turns out, not much. Moving on. Let’s end of a high note, shall we? Received the Estee Lauder Dark Spot Correcting night serum. The fact it is a serum, it gets instant points. The fact it is dark spot correcting, it gets bonus points. I have a hideously splotchy complexion and anything that can make it less splotchy, and therefore less hideous, I’m all over. Looking forward to giving this a try. Well, gang, that’s it for today. Got lots of birthday partying to get done, what with witnessing my daughter take her first drink of legal alcohol and then taking it away from her for the rest of the night and rest of her life. Completely normal behavior on my part, I know.